On Saturday we got the bus to Scales. We had our crampons, micro spikes and ice axes with us. 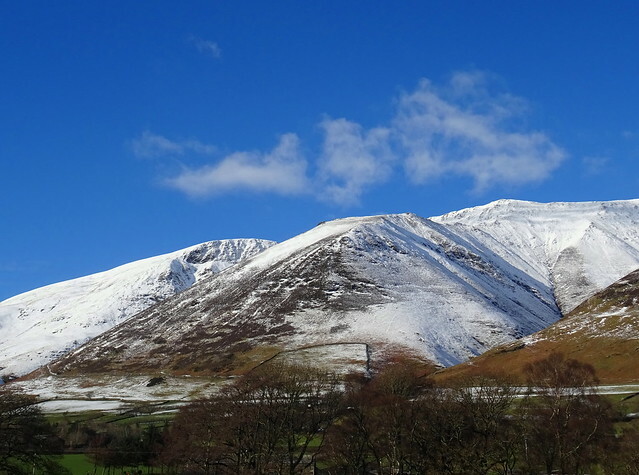 We had a glorious day to look forward to, the forecast was for blue skies and were going up Blencathra by Scales Fell. The day didn't look very good when we got there with low cloud over the summit. We put our spikes on when we reached compacted snow and ice on the path on Scales Fell. Squeaky was playing around in the snow and looked happy enough although we weren't moving fast enough for her. Part of the route is quite steep and hard going in the snow. I was slow We got to about 500m asl and the wind was making its presence felt blowing spindrift right at us and all over Squeaky. We couldn't see where the path went as the spindrift was covering the paths higher up. The ground was more trodden to the right so right we went but this turned out to be wrong, the snow got deeper and deeper and Squeaky was struggling in it. Beefy had to carry her, she was getting really cold, although she had 2 coats on. We turned back down to find the correct path but when we got to the point where we'd made the wrong turn, Squeaky was shivering and we made the sad decision to go back down. 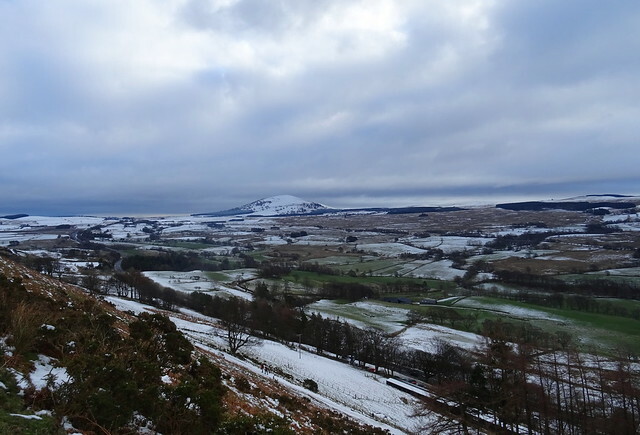 We would miss a great day out on the fell but Squeaky would have been too cold to continue, as we got higher the wind and spindrift would have been even worse for her. I thought we would have been sheltered from the wind on the way up as it was a northerly. 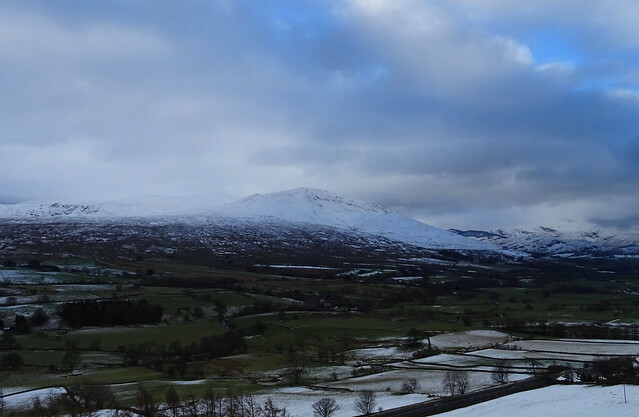 In hindsight I should have chosen a smaller fell to do to see how Squeaky managed the snow and cold. 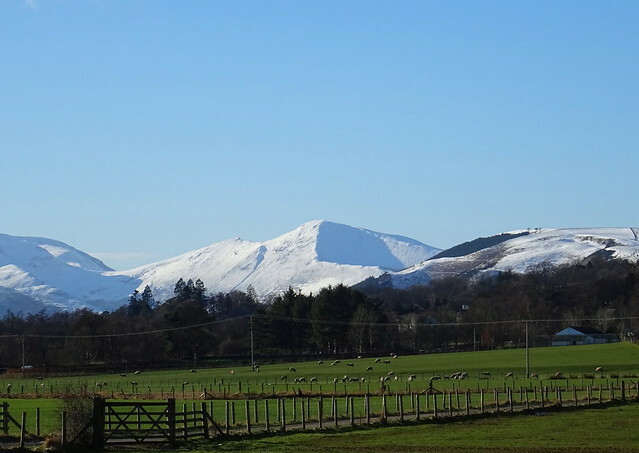 At Scales we crossed the A66 where we planned to walk to Keswick via Castlerigg. We took the footpath to Guardhouse. 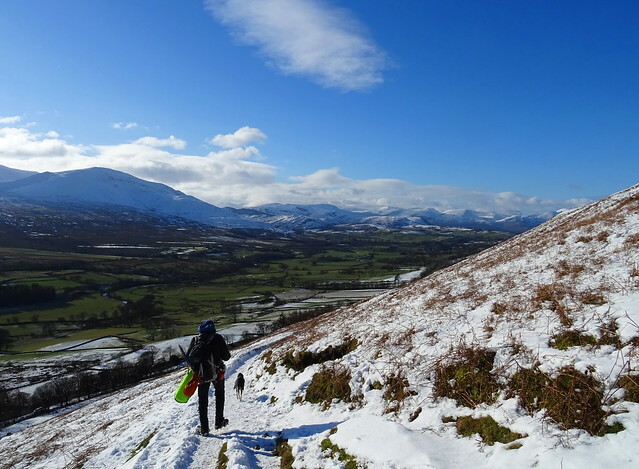 We looked at Blencathra, if only we'd been able to go across the top We will have to get Squeaky a coat with legs in if we take her up in the snow. We were approaching Guardhouse and I looked at the map on my tablet to see where the footpath went next. We didn't have spikes or crampons by now as there wasn't much snow or ice lower down. All of a sudden I'd crashed to the ground, I didn't have time to react, my tablet smacked off the ground and I'm still not sure which part of me hit the ground first, I think it was my left knee. I lay still for what seemed ages but was just a few minutes. I eventually got up, my knees, hip, arms and neck were all hurting. I looked at the ice on the track to the gate that I hadn't seen because I'd looked at the map while still walking. I am always so careful, putting spikes on when its slippery so I don't fall. I hobbled through the gate and we carried on walking, I didn't think I would make it to Keswick. My tablet had survived the fall thank goodness. What happened next took my mind off the pain. 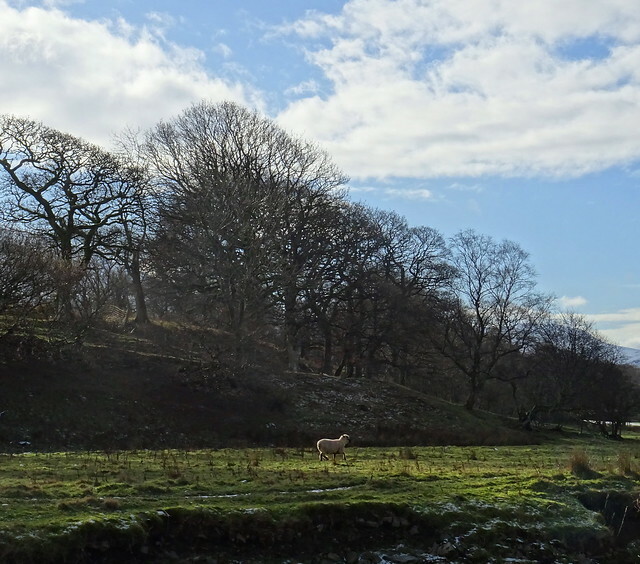 We'd walked for a few minutes from Guardhouse and spotted this sheep. We watched it for a few minutes and thought it was very odd it would stay in the water that long. The water must have been freezing. We walked back to Guardhouse to see if we could find the farmer it belonged to. If not we were going to trespass on the other side of the river to get it out ourselves. A woman in one of the houses came out to help, she was a farmer but the sheep wasn't hers. We went on the footpath again so we could point out the sheep to her, it might not be able to be seen from the other side. We came to the sheep then realised, she was quite tiny compared to the sheep, we hadn't realised how big it was. Beefy had to return to the bridge at Guardhouse and go into the field on the other side of the river to help her lift the sheep out. She had done well to get it half way up the river bank. The sheep couldn't move its back legs due to the cold. Once into the field proper she rubbed the sheeps legs to get its circulation going and it trotted off. 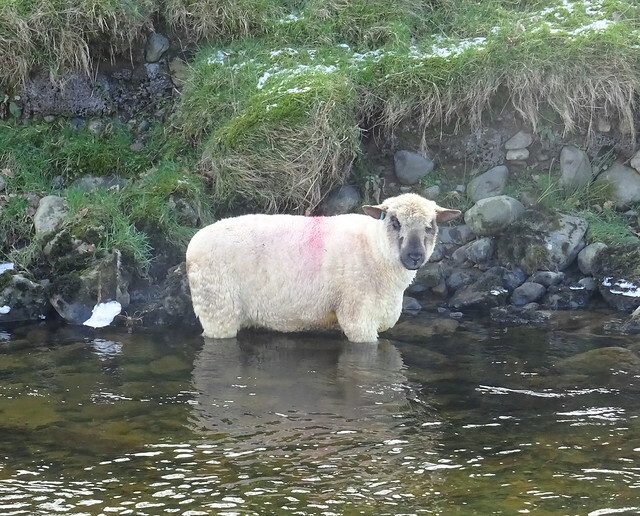 Meanwhile, the farmer whose sheep it was had arrived in his landrover on the side of the river I was on. Someone else must have alerted him about the sheep being stuck. He thanked us for helping out. We couldn't have left the sheep where it was so it was no bother. 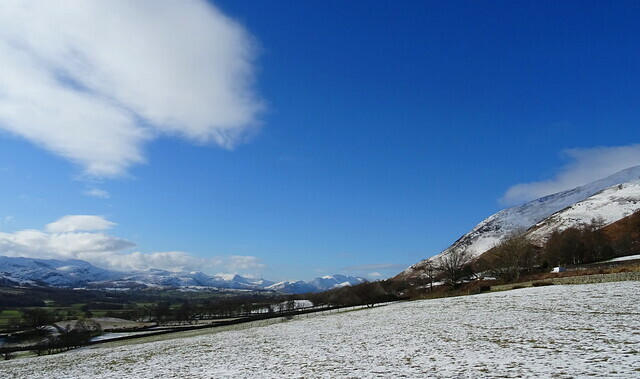 My right hip was really painful when we started walking again and I hobbled to Threlkeld. 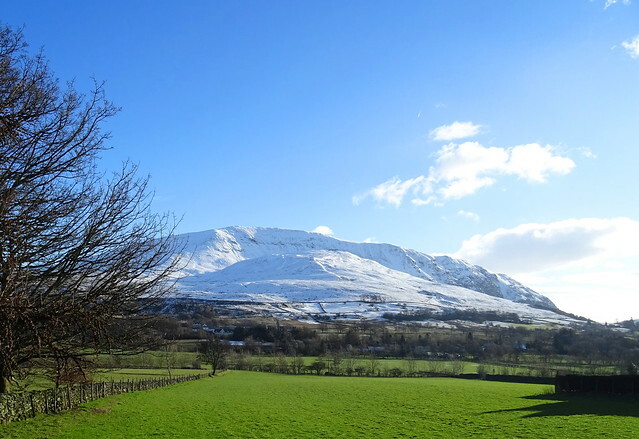 At Threlkeld we got on the bus and we were home for 16.35. Our route was Scales - 500m up Scales Fell - Scales - Guardhouse - Mill Bridge - Threlkeld. 10.9 km with 328m ascent. A weird sort of day, epic for the wrong reasons. In the end we were pleased we hadn't gone onto Blencathra, we wouldn't have rescued the sheep! My hip and leg are still hurting from the fall on the ice but I'm sure I will be fine in a few days. That's some day, that is! Well done for making the right decision for Squeaky and for rescuing the sheep . What a day indeed! Hope you're not too sore after your fall April...and it's nice to see no harm came to the sheep...or Squeaky! An eventful day, April! Lovely photos despite your enforced retreat. Hope that you mend soon. We had a family walk on Sunday, attempted Mid Hill on Orkney Mainland, all of 904' high, but turned back due to deep snow and deteriorating weather at just over 600'. Tess, our Springer Spaniel, was troubled by the snow - normally she's bombproof on a walk, and loves snow, but this was really deep (I stumbled into thigh deep snow in an old peat bank), and 'snow balls' were building up on the hair on the inside of her back legs - "Tessticicles". So we sounded the retreat - sometimes it is the correct thing to do. Hope you're not in too much pain after your fall April. Well done on rescuing the sheep, without your's and Beffy's help, it probably wouldn't have survived. That is the best word ever! My old, sadly deceased, dog, Lucy, used to get these - I found then vaguely repulsive. Sorry to hear about your fall, April - it can be quite disorienting when you go over, can't it? It all happens so quickly and I think momentarily you go into a kind of shock mode. I hope the injury sorts itself out a.s.a.p. 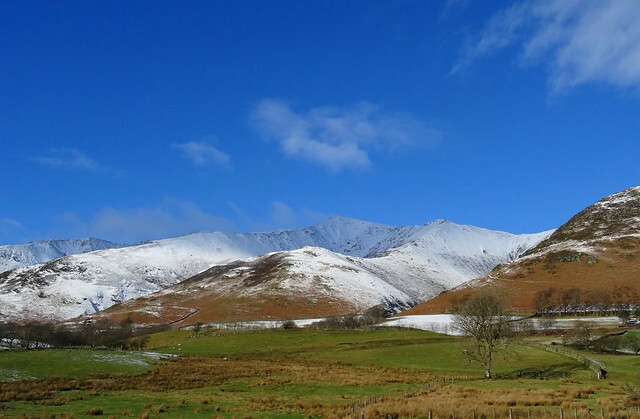 Sounds quite an eventful day, what with the sheep and Squeaky struggling, but you got some beautiful photos as always - Halls Fell Ridge looks breathtaking! Well it sounds an eventful walk even if none of it was planned, I bet it is one you don't forget in a hurry. Hope you are OK now after your fall. Lovely shots of the tops. Blimey, what a day - epic: not 'arf ! Funny how things turn out and perhaps your un-planned retreat was 'planned' after all. In hindsight you did exactly the right things and one Squeaky dog & a frozen sheep would agree. Your photos are wonderful and prove a good day (scenery wise) can be had at low level too. Sorry to hear about your fall though, that must have really shaken you up and I hope you are on the mend. I read an advert yesterday, for Altberg and the 'punch line' is " Look well to each step " - famous words of Edward Whymper. I pondered them for a while and that was before reading this TR. Splendid photos and clarity, exactly how we imagined it would be as we started packing our gear on the Friday afternoon for a short 2-day circuit in that area - then MWIS updated his forecast and Sunday morning looked very grim, not to mention the spindrift and windchill. Oh well, there's time for a winter pitch yet. From your description of the snow depth it might have been unwise anyway with our current limitations. I hope the hip recovers quickly. 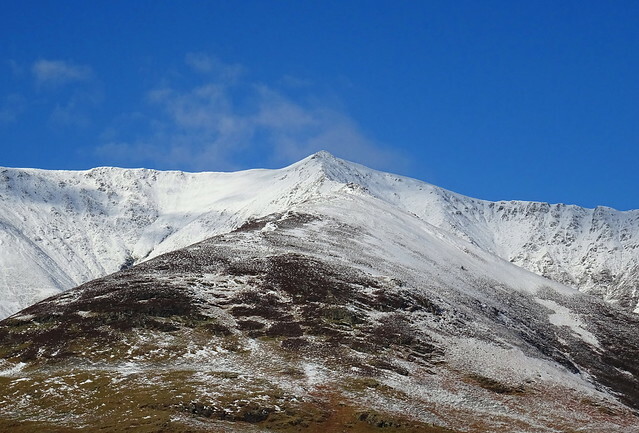 That incident is true to form, it's often said that on a winter mountain walk, the tops are no problem at all, the most likely place to break something is near the starting point. I really hope you're feeling much better now though. The views that you had were superb and must had made the fall and early U turn all the better. 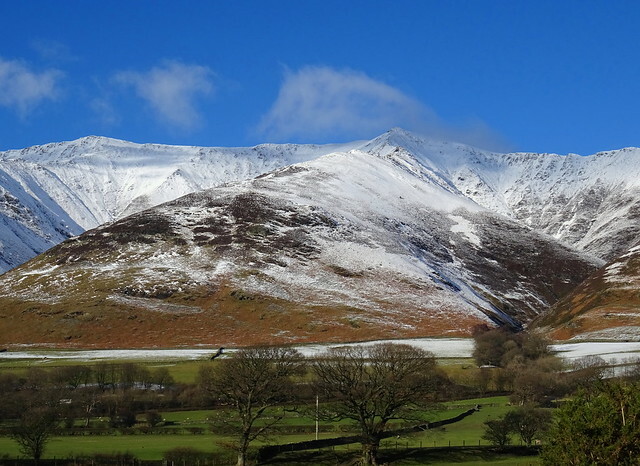 The pics are awesome, particularly Grisedale Pike shining in the sun. Well done with rescuing the sheep - I reckon sheep have a built in death wish - heads through fences, tangled in brambles, cragfast, stuck on their backs and, on Dartmoor, snuggling down on the roadside just round blind bends. Good job you are all okay, sounds a right adventure.